Christ the King Lutheran Church (NALC) in Newcastle, Wyoming, recently sent a gift of altar paraments to Reformation Lutheran Church, New Bern, North Carolina, a two-year-old NALC mission congregation. Greetings in the name of our Lord and Savior Jesus Christ! I write to thank you for the gift of paraments to our church. 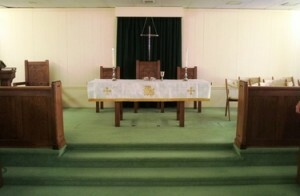 We are a mission congregation of the NALC and have been worshiping a funeral home in the two years of our existence. We will vote this Sunday about moving to a different facility that will allow us to do more outreach to the New Bern community. Your gift is therefore very timely and one that will be put to use immediately. All of us at Reformation Lutheran Church are very grateful to you for this gift and for shipping it to us at y our expense. Thanks a bunch for this gift! May the Lord continue to bless each one of you and your work for the expansion of His Kingdom! Reformation Lutheran Church has, indeed, moved to a new facility. The first worship service in their new building was Sunday, November 3, 2013, and the altar paraments were proudly displayed.